A home is burglarized every 15 seconds in the United States, and over 90% of those robberies occur when no one is at home. If your home appears visible, secure, and occupied, the chances of experiencing a break-in are significantly lower. Below are some of the most effective and proven methods for beefing up your home security without breaking the bank. Motion-activated floodlights near any entrances to the home make an excellent deterrent, and window-break alarms provide an inexpensive alternative to a full security system. One area that many people neglect is the front door—most doors aren't reinforced, which means that a single well-placed kick is often all it takes to gain access to your home. The most secure door is one with a double-cylinder deadbolt and reinforced plates on both the door and the frame, both of which can be added to most existing doors at a small cost. One of the easiest ways to make a thief think twice about targeting your home is to get rid of anything that might conceal them. Tall hedges, privacy fences, and dark yards make it much easier for a burglar to hide from you and your neighbors. Investing in motion-activated porch lights or a timed light will make your home a riskier proposition for would-be thieves. Many people keep their spare key under a doormat, flowerpot, or rock, but that's exactly the reason why you shouldn't. Experienced thieves know all of the usual hiding places, turning your spare key into a hassle-free ticket to the valuables in your home. If you are worried about being locked out, then leave a key with a trustworthy neighbor instead. A small floor safe is one of the most inexpensive ways to protect important valuables. Safes are a great place to store important documents, such as birth certificates, passports, and financial records, as well as expensive jewelry and any cash you might have. Keep in mind that a small safe could still be carried off by a determined burglar, so store it in a place that is out of sight. A simple and inexpensive way to deter thieves is to use scare tactics. Place a security system sticker on a window in clear view, even if you don't actually have an alarm installed. 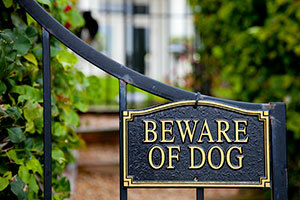 Similarly, most thieves won't stick around to find out if your "Beware of Dog" sign is true or not! If you are going on vacation or leaving home for more than a few hours, consider leaving a light or TV on to make it look like someone is awake in the house. The majority of thieves are looking for a quick buck and won't target homes that put them at risk of a confrontation.